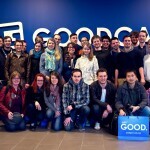 We recently invited over 50 students from various faculties of the Ilmenau University of Technology to visit us at our offices and get to know Goodgame Studios as a potential employer. First of all the group was given a tour of our offices, the usability lab, and our green, open premises with our swimming pool. This gave them an idea of the great working conditions and technical facilities at our offices. Afterwards, our CTO Stefan gave a presentation introducing Goodgame Studios in more detail, followed by three employees who gave insights into their daily work. Thomas talked about the job of the marketing team, Katharina gave an overview of the conversion department, and Sören explained which skills are important as a project manager. Students about to finish their degrees are bound to have questions about entering professional life, and after the presentations our colleagues from the HR department were on hand to answer these and give tips about applications. The visit was an illuminating and instructive experience for all involved. 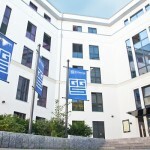 Matthias Wagner, a lecturer at the Ilmenau University of Technology, said: “The presentations and tour gave us a good insight into the work done here, and we were thrilled by the atmosphere at Goodgame Studios.” For our part, we at Goodgame Studios look forward to welcoming more student groups and introducing ourselves to them.